Lifestyle plays such an important role in managing chronic disease like hypertension. Making healthy diet choices—eating more fruits and vegetables, reducing sodium—and exercising regularly are both key components of a healthy lifestyle, as is quitting smoking. But many may wonder if (and where) alcohol fits in to this. Here’s the good news: moderate drinking can be part of a healthy lifestyle. In small amounts, alcohol may actually lower blood pressure slightly. And, some types of alcohol are recognized for potential health benefits. Red wine, for example, has developed a bit of a reputation for promoting heart health. Antioxidants in the wine can help raise HDL or “good” cholesterol which can, in turn, lower the risk of developing heart disease. Now for the bad news: while a little bit of alcohol may lower blood pressure, drinking too much can raise blood pressure. Not only that, but alcohol can interfere with many medications, making them less effective. And finally, all alcohol contains calories which can contribute to weight gain. The key thing to remember is drinking is fine in moderation. 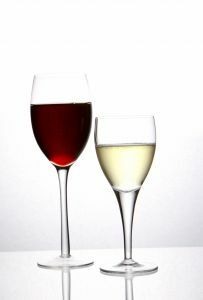 Moderate drinking is defined at no more than 2 drinks a day for men and 1 drink a day for women (a “drink” is 12 oz of beer, 5 oz of wine or 1.5 oz of liquor). If you choose to drink, be mindful of how much alcohol you’re consuming. If you don’t drink, the best advice is: don’t start—you can get the health benefits of alcohol in other ways (like diet and exercise). Talk to your healthcare provider if you have any questions about alcohol or your alcohol use.